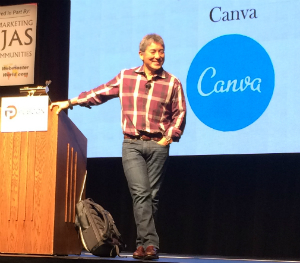 Guy Kawasaki (@GuyKawasaki) is a name-brand marketing pro and evangelist. He’s the author of “The Art of Social Media,” “The Art of the Start,” “APE: Author, Publisher, Entrepreneur” and “Enchantment,” plus he has a million and a half Twitter followers who follow him for his marketing insights. He’s also wears the title Chief Evangelist at Canva. The topic he’s sharing with this crowd of marketers at Pubcon Las Vegas is how to improve your marketing in the age of social media, the democratization of platforms. How do we embrace social media today? The key to understanding social media in this age is through the metaphor of online dating. In online dating, there are two kinds of websites. eHarmony requires you to fill out psychographic surveys to find out how compatible you are and to whom. Tinder is on the other extreme; you make an immediate judgment based on the picture. Guy says that marketing is working in a Tinder world. The purpose of the cover photo is to show how you’re interesting — what you’re passionate about, what your brand stands for. Tell a narrative – He shows his Facebook cover photo and his Google+ cover photo. They’re not the same, so I guess these don’t have to be consistent. Optimize size – Check the aspect ratio and dimensions. Go dark – He says this shows a certain seriousness and gravitas. We go through examples of avatars and cover photos from real life. They’re all bad examples, including a dog as the avatar, a family as the avatar but the user’s head is cut off, an example of the Google+ default cover photo, and a family with photo red eye. He shows another example from the Porsche Facebook brand page. You can see that, in the small size that the avatar often shows up in, the logo is too small to recognize; this could be improved if the white space was removed from the image. Porsche has strict brand standards about white space around the logo, but that standard was probably created in the 1980s and today they have a suboptimal avatar. “Every profile is your professional profile,” Kawasaki says. Recruiters and hiring managers don’t think of someone’s profiles as professional vs. personal or social. He says he only makes his judgment from LinkedIn. It’s just like Tinder: hire, don’t hire (swipe, swipe motions). It is that quick. Guy’s son has a LinkedIn profile, and his photo was obviously cropped out of a group shot from a fraternity winter formal. When Guy told him to fix his avatar, his son said, “I don’t even use LinkedIn.” Recruiters use LinkedIn. Every profile is your professional profile. 4. Perfect your business card. Include your cell number – He gives out his card a lot. Why put his personal cell phone number on a business card and risk someone you barely know calling you at all hours? This never happens. The benefit is that it makes it very easy for serious business contacts to reach you when they need you. A good test is to see whether Evernote can OCR scan your business card and get all the information. On your email signature, include all the information from your business card. This includes your email address. This protects you from forwarded emails that might strip an earlier sender’s email address. Tip: Use Evercontact and it will scan all your email and find all emails with signatures. 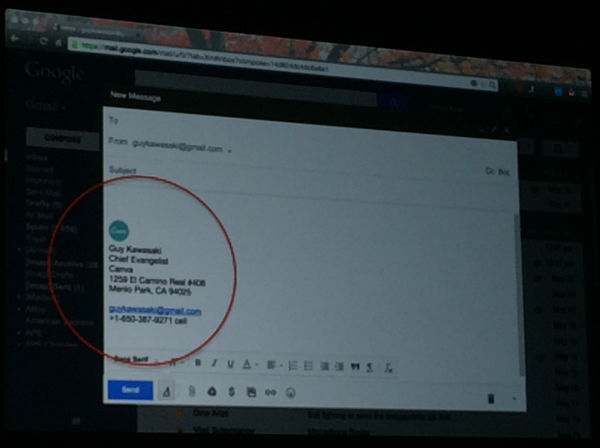 It matches Google Contacts and Gmail and merges the signature data with the contact. 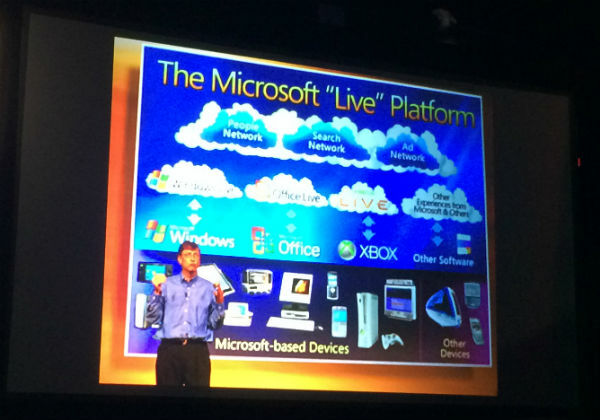 If you’re in marketing today, you need to be able to pitch, give keynotes and speak. These tips impact optimization for SlideShare.net, which is a very powerful network. Go from picture to demo as soon as you can. 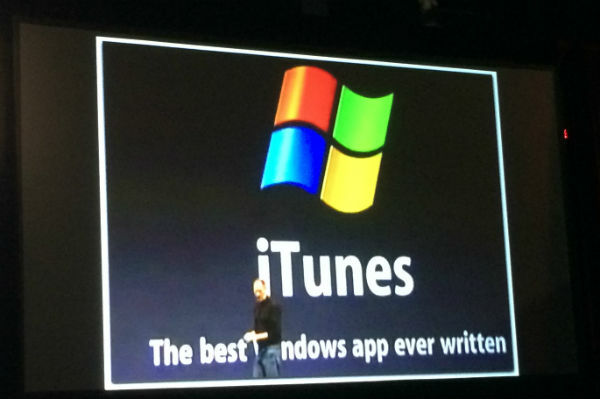 The first slide is telling people what you do. The next slide is the pain you’re solving, the opportunity. The next slide you do a demo. The demo is so fantastic, you never get to the rest of your PPT. That is the perfect pitch. Shoot horizontal. Periscope and Meerkat and horizontal video aside, Guy thinks it’s a horizontal world. And tightly cropped is even better. Light from the front. Reverse positions. Even though the background may not be as beautiful, the well-lit person is always the more interesting story. Crop crap constantly. Can’t crop too much. Optimize dimensions. Canva has optimized sizes for every social media service. Some people think you do social media after marketing, or that SM is a subset of marketing. Social media is marketing. For most small organizations and people, social media is marketing — and that means posts should be perfected. Embrace the NPR model. NPR runs a fundraising campaign every year. People tolerate the pledge drive because they provide great content every day of the year. In social media, look to provide value and you’ll be earning points and getting the right to use social media as a marketing platform. Who do you serve in business? Serve them in social media. As an airline, you can create content such as “this is how you pack for a weekend.” This is TSA precheck program. Pass the reshare test. Likes and comments aren’t nearly as important as reshares and retweets. It’s the latter that says that people put their reputation on the line for you. Add graphics. 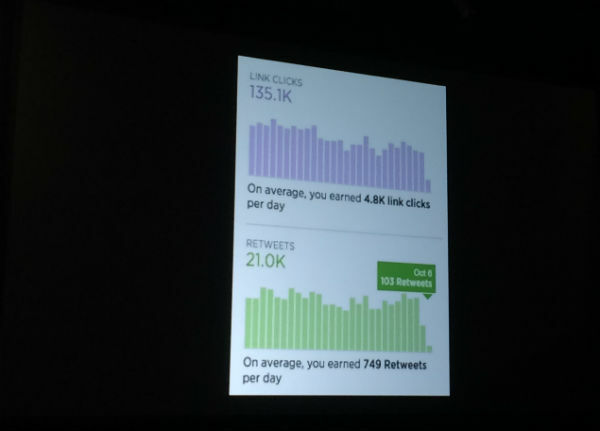 All the engagement metrics double with graphics. In Twitter, you can have up to four pictures in a tweet, which means you can tell a story. Upload video natively to Facebook. Yes, that means you have extra work. Think about it from Facebook’s perspective. Would Facebook rather promote their own content or YouTube’s? Facebook video autoplays when you scroll on it. The reach of Facebook videos is about three times more than a post of YouTube embedded videos of the same content at the same time. If you hear experts say don’t post multiple times, it’s because it’s not personal and people will think you’re not hand-posting it. Kawasaki says that two or three times a day, he gets comments that he tweets too much and he’s a spammer. He’s come to ignore that. He has 1.5 million followers on Twitter. It’ll take 300K days to piss everyone off. His advice: Post three times, eight hours apart, because different people click the link every time. You should accept the fact you will piss someone off. If you’re not upsetting people on social media, you’re not doing it right. 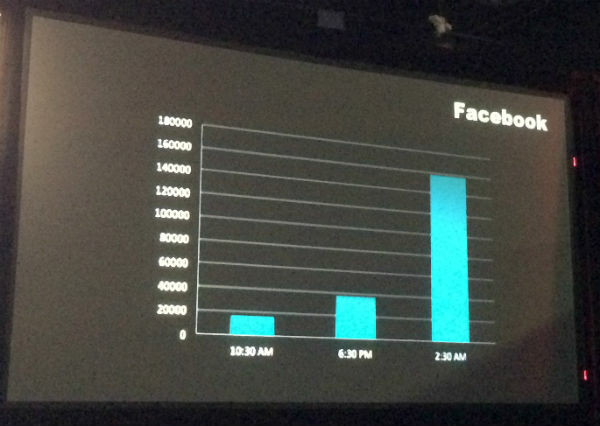 You’ll anger people more on Facebook, because it’s less forgiving of spam. But if it’s important to you, then use the repeat post method. People use Pinterest like they do Google. How to cook a turkey — people search Pinterest for that. So make it optimal when people pin your posts. Test your pages with the Pinterest extension to see which of your images work best. Kawasaki’s growth hacking (the new SEO) strategy is “post good stuff.” He gave us tips, so try them, experiment. To perfect your methodology, keep experimenting. Social media experimentation is poor science. You can’t control all the variables. But if you wait for the point when science is perfect, it’s too late. Same posts where one has a photo and one doesn’t — see which gives you more engagement. Scan your business card with Evercontact. Post a bit.ly link at multiple times and see if you get three times the engagement. To help you with a lot of the steps he outlined here today, check out Canva.com — he promises that you’ll find it to be an easier, faster Photoshop. In the BCI content team, we use Canva. Every. Single. Day. We use it to add graphics to our social media and blog content. So if Guy didn’t convince you, there you go.